The sun is out, and it is the ideal time to be soaking up those rays, whilst sat out in a beer garden! 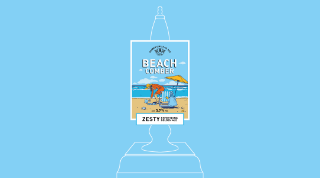 Fuller's refreshing and sessionable beers are the perfect accompaniment to a warm day, so why not head to a Fuller's pub for a pint Beach Comber, a new summer seasonal? The brewing team at Fuller's believes that Beach Comber is the next best thing to a dip in the sea; a light, golden ale that brings refreshment reminiscent of a cool sea breeze. Anthony Smith, Brewing Team Leader at Fuller's, talks us through what makes up Beach Comber, and the ale's delicious tasting notes in the video below. What Is In A Brew of Beach Comber? Beach Comber is brewed with a combination of American and Australian hops, and uses the Gales yeast strain. It is made from a combination of pale malt, wheat malt, golden oats, and Munich malt. If you are a fan of golden oats, why not give Fruit Loop a try, which is brewed using naked golden oats? What Does Beach Comber Taste Like? Beach Comber is a zesty golden ale that bursts with lime, mango, and pink grapefruit flavours. Fresh, floral notes of herbs and pine come through on the nose, complemented by a subtle berry character on the palette – a notable feature of all beers brewed using the Gales yeast strain, with Alc. 3.7% Vol. Available from Fuller's pubs from 21 May 2018.